With some warmer weather here we decided to have a look at a couple of wet caves in the Clydach Gorge. 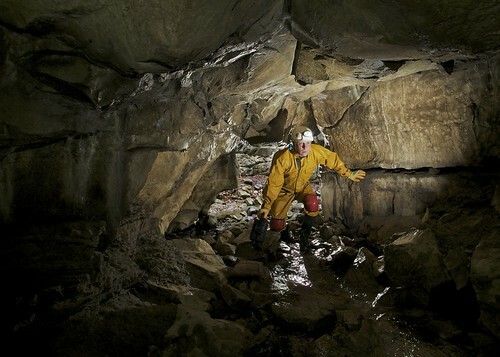 The plan was to visit Shakespeare's Cave, a sporting little number in a tributary to the main gorge. At a little under 400m this would only take a couple of hours, so our plan was to visit Ogof Craig A Ffynnon in the afternoon and visit North-West Inlet while we were still kitted up in wetsuits. Meeting at Luigis as befitting local custom, we had breakfast before heading off to the now closed Drum and Monkey pub at Blackrock to get kitted up for the caves. A comedy fashion show then took place as we pulled on our mysteriously shrinking wetsuits before we headed under the Heads of the Valleys road and down into the gorge. The weather had broken and it was raining lightly, but water levels were still low after such a long dry period. A couple of circuits of Shakespeare's Neighbours Cave were undertaken before we headed into the cave proper. We split into two groups - super fast sporty Ninja Cavers and following up the rear the Zimmer Frame Brigade encumbered with video and camera gear. The trip passed without much event, bar a challenge at the fifth duck which had silted up, some of the first group had turned back thinking this was the end of the cave. Mel led the way through the duck and Keith and Mark followed to complete the final section of streamway. It was then out to find the next cave of the day. Wal near the entrance to Shakespeare's Cave.